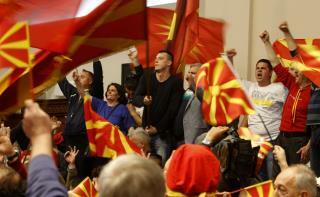 (Newser) – Hundreds of protesters forced their way into Macedonia's Parliament Thursday and attacked several leading lawmakers, leaving Social-Democratic Union party leader Zoran Zaev with blood pouring down his face. The protesters, supporters of the conservative VMRO party, were enraged by the election of a new Parliament speaker by a coalition of Social Democrats and ethnic Albanian parties, the BBC reports. Nationalists, who are calling for new elections, have been protesting in the streets since Zaev created the coalition. His attempts to form a government have been blocked by President Gjorge Ivanov, whose candidacy was supported by VMRO. It is so bad when other countries cannot even vote a semblance of order for themselves democratically. Our own country is running on the fumes of the past and stories like this one show how chaotic and unraveling the world is truly becoming. Soon to be in DC? Might be entertaining! And these are the people that Trump wants to surrender our country to? Scary!